sentenced to 28 years imprisonment without an option of fine. He was convicted by Justice Olubunmi Oyewole of the Ikeja High Court this afternoon. George was specifically convicted on 35 out of the 68-count charge which border on contract splitting, inflation, abuse of office and disobedience to lawful order. Justice Oyewole sentenced all the six accused persons to two years each on seven counts of abuse of office and another six months for 28 charges bordering on disobedience of lawful order. The judge held that all the accused persons were guilty of splitting numerous contracts as members of NPA board from 2001 to 2003. According to the judge, there were incontrovertible evidence that all the six accused persons intentionally and knowingly condoned the splitting of contracts. Also, Justice Oyewole held that Bode George and his co-accused disregarded lawful order passed to them by the Ministry of Transport stipulating a new approval limit of contracts in all government parastatals including the NPA. According to the judge, all the accused persons in their evidence acknowledged receiving the said order from the Ministry of Transport but chose by their own volition to disregard the order. He, however, held them not liable for contract inflation. Most PDP supporters in the court room burst into tears as Justice Oyewole pronounced the judgement. Most of them tried to provoke security men around the court into a fight. In his allocutus, George's counsel, Chief Tunji Ayanlaja, SAN, appealed for leniency as George and the six accused persons were doing the right thing but following a wrong procedure. EFCC prosecutor, Festus Keyamo, thanked the court for a well considered judgement and said that it will serve as a deterrent to corrupt public officers. During the ensuing melee, an elderly man fainted and he was being revived at the time of filing this report. Anti-riot policemen at the court premises called for a reinforcement to bring the situation under control. 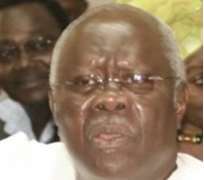 Bode George, Arc. Aminu Dabo, Captain O. Abidoye, Alhaji Abdulahi Aminu Tafida and Alhaji Zanna Maidaribe and Engr. Sule Aliyu have been facing a 163-count charge of conspiracy, disobedience of lawful orders, inflation of contract and contract splitting. During the trial which lasted for 15 months, one of the major prosecution witnesses, Engr. Mustapha Bukar, a director in the Federal Ministry of Transportation, who chaired the 7-man administrative panel instituted by the Federal Government to probe the activities of the NPA, said his panel discovered that about 29,526 contracts were awarded by the management of the NPA between year 2001 and 2003. In his evidence, the witness said that some of the contracts were split and inflated before they were awarded to different contractors by the NPA management. However, the witness, admitted under cross-examination by counsel to the defendants that there was no evidence indicating that the contracts awarded were given out or signed by the Board of the NPA led by Bode George. Engineer Bukar, specifically, pointed to the court that the board while awarding contracts did not abide by a certain circular from the Federal Government which spelt out the limitation of the Board in award of contracts. The witness said the price intelligence units system and due process were ignored by the management in the award of contracts during the period under review. However, under cross-examination by the defence lawyers led by Chief Tunji Ayanlaja, (SAN), Engineer Bukar admitted that one of the committee members, Greg Ogbueifon, had earlier written a petition against the NPA Board over some issues. He also agreed that it was morally wrong for same Ogbueifon to be a member of the committee investigating the management. Ten other prosecution witnesses corroborated Engr. Bukar's evidence with the prosecuting team led by festus Keyamo urging the court to convict Bode George and his co-defendant as the allegations against them have been proved beyond reasonable doubt. Counsel to Bode George, Chief Tunji Ayanlaja (SAN) at the close of his case urged the court to dismiss the charges as his client has proved his innocence. In his joint defence with the other defendants, he argued that all the contracts awarded under his leadership in NPA were backed up by bank guarantees and irrevocable letters of credit from reputable banks. To this end, he denied that he and other defendants disobeyed any lawful order. He told the court that there was never a time that any contract brought to the Board was split and that there were appraisal officers who carried out market survey and price intelligence before advising on what sum a contract should be awarded for and that it was not the responsibility of the Board to fix prices on contracts to be awarded. He further said that the 2001 circular expected to guide award of contracts was never sent to NPA while he was Chairman of the Board of NPA, but that the Board got to know about the circular several weeks later through a member of the Board. He said contrary to their expectations, the circular which was signed by the minister of finance was addressed to the Ministry of Water Resources without a covering note, adding that no such letter came from the Transport Minister who is the supervisory authority of the NPA. He subsequently prayed the court to declare that the prosecution failed to prove its case beyond reasonable doubt on count 58-68 dealing with abuse of office in line with Section 104 of the Criminal Code Law of Lagos State and also failed to prove the case of conspiracy against the defendants as well.